An essential component of any kitchen space, it’s important that your fridge freezer is reliable, powerful, equipped to accommodate the bespoke needs of your household. We offer a huge choice of high performance Swan fridge freezers that will allow you to enjoy a whole host of innovative features including a generous capacity in a compact design. 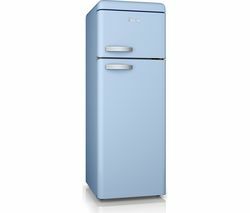 Within this category, you will find a fantastic selection of Swan fridge freezers including the Swan SR11010CN 80/20 Fridge Freezer, which is available in blue, black, red and green. 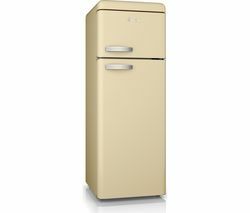 Proving that both style and function can work together with effortless ease, this range of retro inspired fridge freezer will instantly enhance the aesthetic appeal of your kitchen. Cool, quirky and wonderfully stylish, Swan fridge freezers are instantly distinguishable and boast a whole host of handy storage features that will allow you to organise and store your food with ease. With the capacity to store 168 litres in the fridge compartment and 40 litres in the freezer cavity, a Swan fridge freezer is prefer for accommodating the demands of families. But that’s not all… thanks to their A+ energy efficiency rating, you will be able to make significant savings on your household utility bills. What’s more, with a Swan fridge freezer, your fresh produce will also last longer when stored in the salad crisper, as this space provides the ideal temperature and humidity level to ensure your favourite fruits and vegetables remain fresher for longer. If you can’t find a Swan fridge freezer that takes your fancy, don’t worry. We also offer options from other leading home appliance brands including Kenwood fridge freezers and Miele fridge freezers.